Whenever anybody asks me what “Aquaman” is like, I mention an early scene where opposing Atlantean forces square off and debate the kingdom’s future. One side rides armored seahorses that whinny. The other rides armored sharks that roar. "Aquaman" is as concerned with scientific accuracy as “SpongeBob Squarepants.” And that’s one of many reasons why I like it. It takes skill to be as ridiculous as this movie about a half-human, half-Atlantean prince who’s known on land as Arthur Curry (Jason Momoa) without seeming to condescend to the material. Directed by James Wan (“Saw,” “The Conjuring”), it’s part of a thriving subcategory of superhero movies, also represented by “Spider-Man: Homecoming,” “Thor: Ragnarok,” “Venom” and both “Ant-Man” pictures—sweet, goofy, at times psychedelically weird films that mostly reject the sour gloom that gets mistaken for maturity. But that’s not to say that those movies aren’t serious in their own way. “Aquaman,” in particular, feels simultaneously like a spoof and an operatic melodrama. Any film that can combine those modes is a force to be reckoned with. Aquaman made his DC Expanded Universe debut in “Batman vs. Superman” and was part of the ensemble in “Justice League,” but this is the first movie that’s put him front-and-center. The results are enjoyable enough that you may wish Warner Bros. had done it sooner. While it’s not billed as such, this is an origin story, positioning Arthur as a reluctant hero. As conceived by screenwriters David Leslie Johnson-McGoldrick and Will Beall, adapting Mort Weisinger and Paul Norris’ source, Arthur is a mixed-species character who feels alienated from both of the civilizations he embodies. He's the offspring of union between a lighthouse keeper named Tom Curry (Temura Morrison) and a stranded Atlantean named Atlanna (Nicole Kidman) whom Tom nursed back to health. Atlanna then returned to the sea and was put to death for the sin of birthing a half-human child. Arthur has long hair and tattoos, a knack for wisecracks and a fondness for beer, and just wants to be left alone. 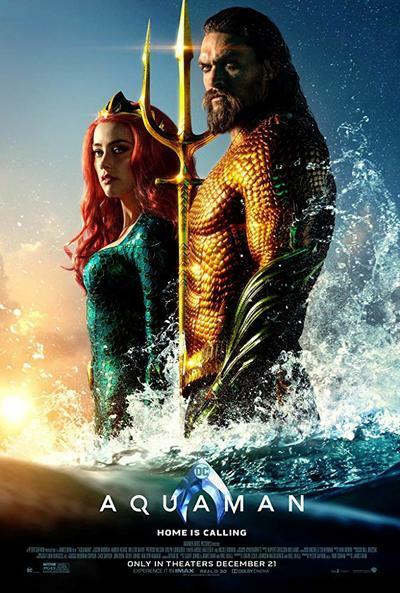 He rejects allegiance to land or sea, but eventually succumbs to prodding by the idealistic Atlantean Mera (Amber Heard) and becomes a uniter at a time when radical forces, led by Arthur’s treacherous half-brother Orm (Patrick Wilson), want to destroy the land-dwellers as revenge for polluting and militarizing the ocean. Arthur is one of those Joseph Campbell-certified, Fated-for-Great-Things heroes, thus the mythically resonant first name. He even has the equivalent of the moment where the future King Arthur pulls the sword from the stone. The movie is overlong and a bit repetitious (as big-budget superhero films tend to be), and its second half is more distinctive than its first because it lets its freak flag fly. But Wan and company mostly do a brilliant job of shaking the algae from cliches. Rather than get bogged down in plot particulars, they concentrate on characterization and performances, production design, costumes, and visual details. Every frame has marvelous details that you might not catch on first viewing. The Atlanteans use their mouths to speak, but there are no visible bubbles, only vocal distortion that suggests "bubbly-ness." When the characters aren’t swimming at dolphin speeds, they square off against each other as if they’re standing on a sidewalk on land, bobbing ever-so-slightly. The water dwellers have lighting that's supplied by luminous deep-sea creatures and high technology that’s inspired by aquatic animals and plants. Some of the battle armor features oversized crab and lobster claws. In one scene, Mera wears a dress with a collar made of glowing jellyfish and a multicolored seagrass skirt. In an arena sequence, we hear taiko drumming on the soundtrack, and the camera moves to reveal a lone percussionist: a giant octopus. The fight sequences use high-speed, 360-degree camerawork to create surprise and delight, rather than to add superfluous hype. We’re constantly surprised by where movements start and end, and there are multiple slapstick jokes woven into each encounter. "Aquaman" embraces the childlike absurdity of armored Atlantean troopers coming up onto the land and martial arts-fighting their enemies in broad daylight, presenting the mayhem as plainly as a kung fu showdown in a schlock fantasy like “Infra-man” or TV’s “Mighty Morphin Power Rangers.” Rather than cross-cut between multiple lines of action, the camera sometimes swims or flies from one location to another and back again—most spectacularly in a chase-and-fight sequence set in a Sicilian seaside town, where combatants smash through the walls of cliffside homes and scramble across tiled rooftops. Momoa anchors the film, imbuing the big guy with surly charm, like one of those early Marlon Brando characters who was a jerk most of the time, but so magnetic and wounded that you couldn’t help but care about him. The rest of the cast is just as committed, notably Kidman as Atlanna, who carries on as if she’s playing the lead in an ancient Greek tragedy; Yahya Abdul-Mateen II as David Kane, aka Black Manta, a pirate who swears revenge on the hero; and Willem Dafoe as Atlantis’ counselor Vulko, who advises caution and reason to no avail, and who’s like a second (aquatic) father to Arthur. The most remarkable aspect, though, is the way "Aquaman" pushes against the idea that every problem can be solved by violence. There are plenty of bruising fights on land and sea, plus laser shootouts and aquatic infantry clashes, but some of the most important showdowns are resolved peacefully, through conversation, negotiation, and forgiveness. Men as well as women cry in this movie, and the sight is treated not as a shameful loss of dignity, but as the normal byproduct of pain or joy. For all its wild spectacle and cartoon cleverness, this is a quietly subversive movie, and an evolutionary step forward for the genre.